Review: Though silly looking, the Crimson Butterfly's build is a genuinely devastating deck that can wreck even with best of Vanguard's power creep. This is rooted in Brigitte's skill; it effectively turns every grade 3 remaining in the deck into a trigger unit, and right from the same trial deck there is one card in particular which combos amazingly with this ability. 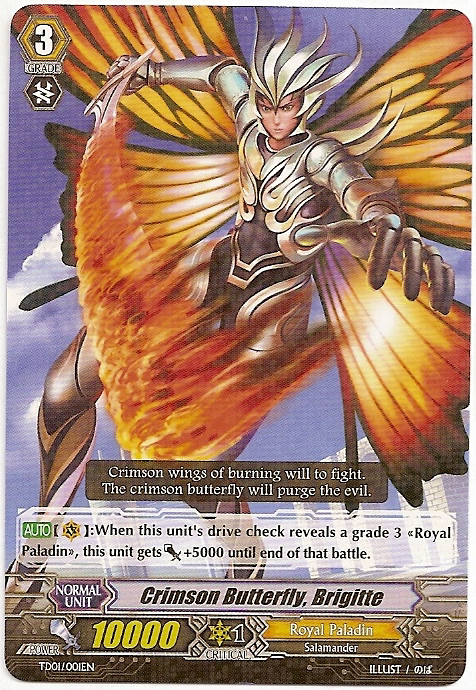 Gancelot's first skill is to return himself to the deck to search for a Blaster Blade and add it to the hand, but according to the official Q&A #50, since the first thing you do is add Gancelot to the top of the deck, if after looking at the deck the card you are searching for is not present, Gancelot does not return to the hand. You shuffle the deck and put it back down. This means that even with no Blades to search for, Gancelot can be added to the deck late in the game where there are very few cards remaining. With 17 cards in the deck being grade 3s, this more than doubles the regular trigger count. In this build, with a ride every turn, there will be approximately 36 cards left in the deck at the time of riding Brigitte(assuming that Lien is not used, although she most certainly will be.) These odds work very well in Brigitte's favor, as the odds of checking a grade 3 are actually higher than that of a trigger unit. Brigitte will be crossing the 20000-power borderline nearly every turn, acting as a significant power-up--while the checked cards work as excellent fuel for Lien's skill to further thin the deck and add Gancelots back to it. To expand on the other end of the trial deck's image, Gancelot's greatest utility is as a decksearcher for Blaster Blade. 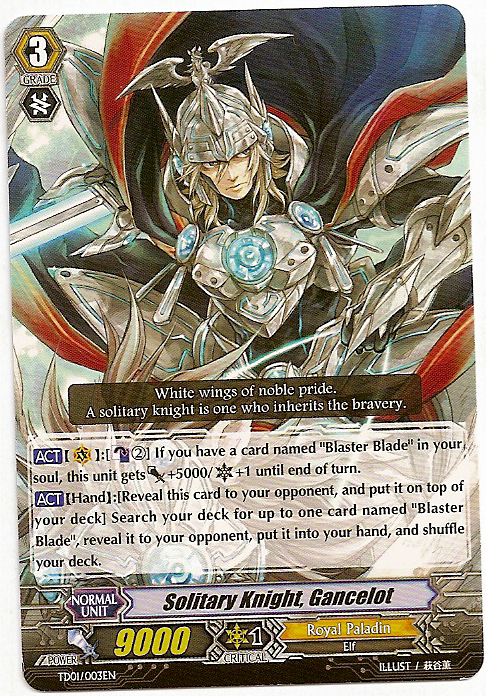 This is the equivalent to being able to run 8 of him, as it turns a Gancelot draw into a Blaster Blade draw, albeit with the restriction that you need to use his ability the turn before you intend to ride Blade(said skill only works in the main phase, which the ride phase precedes.) 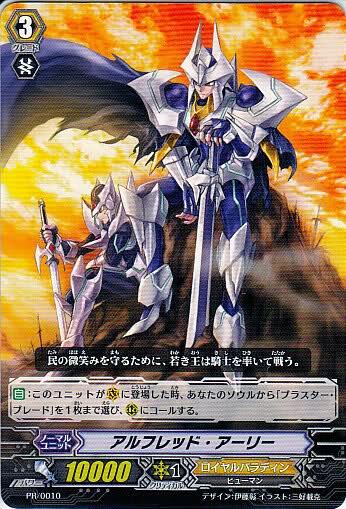 Between these two cards, Blaster Blade is very nearly a guarantee. Even if you have no intentions of riding Blaster Blade through this skill, the ability is still useful as it ties into other units like Brigitte and Majesty Lord Blaster, while providing you with an additional intercept or guard. 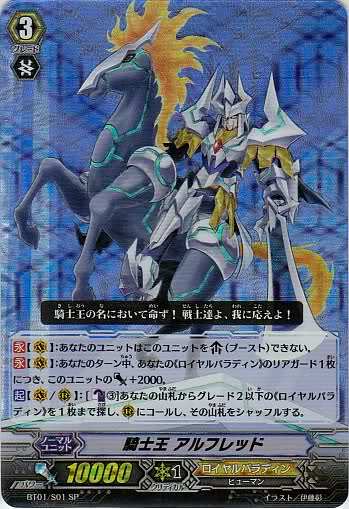 In terms of his offense, Gancelot is a visible precursor to Phantom Blaster Dragon. The difference being that Gancelot does not carry the same incentive with him that the Blaster Dragon does; for a counterblast 4 Gancelot can give himself 19000 power +2 Critical, while the Blaster Dragon can gain for the same CB reach 30000 power +2 critical. Gancelot is much easier to defend against, his skill is more conditional, and his clan is already so expensive in terms of counterblasts that this type of attack is inadvisable unless one is absolutely certain that the opponent cannot defend against it. For the most part, Bors already achieves the same effect on the opponent's hand, but as a rearguard for a measly counterblast 1. However, Gancelot could be thought of as "training" for learning to use Phantom Blaster and Majesty Lord. The Solitary Knight's highly inoffensive power also makes him difficult to protect. Against 20000-power columns, Gancelot requires a minimum of two cards to defend against already. When the opponent starts really powering up with Holy Charging Roar or Damned Charging Lance, this problem only advances. 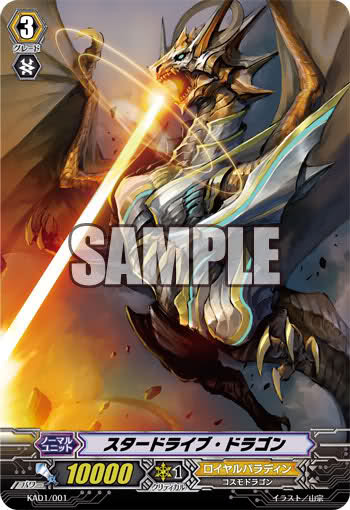 Sadly, Stardrive Dragon carries even less offensive use than Gancelot. 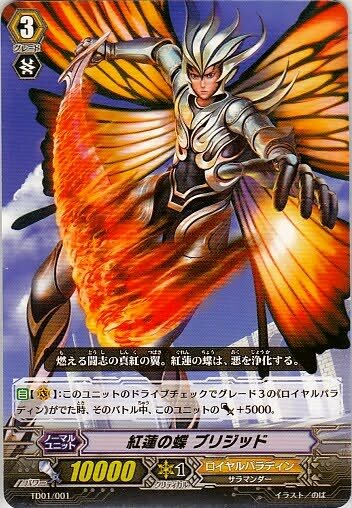 Being a difficult to obtain promotional card, it is rather lackluster considering its rarity, as it's a 10000-power unit without a skill. It can easily sub in for some of the more difficult-to-obtain cards presented in the Brigitte build above, and most likely will if you participated in a workshop where Stardrive was given out since Alfred it is RRR, but is otherwise fuel for Lake Maiden, Lien. There is no such thing as a useless card--if you love it, Star Drive Dragon can be a great card for you. However, it will require a perfectly built deck of support to keep working, and so there is little reason to use it outside of playing favorites. Alfred is where things heat up for the Paladins. As a vanguard he cannot be boosted, but gains +2000 power for each Royal Paladin rearguard. 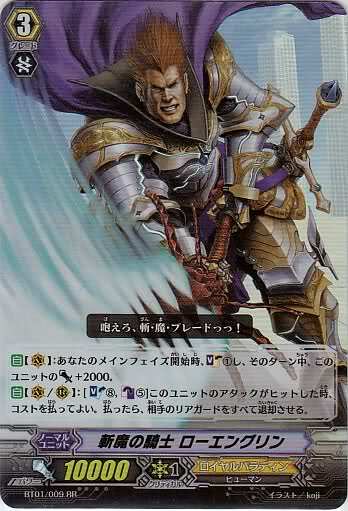 This, combined with his innate ability to swarm the field using a counterblast 3, and the general ability of other Royal Paladin units to call out their allies, makes his vanguard effect solid and easy to fill. Strangely, I've never seen this combined with a double Barcgal build, chiefly because people act as though it's a criminal act to include more than 1 nontrigger grade 0 in a deck. In a x2 Barcgal setup, once riding Alfred you would CB3 to superior call the second Barcgal behind him, whom you would then rest to superior call Flogal. That's an immediate +4000 power boost, and two less units that need to be called from the hand to fill Alfred's power. Since stand triggers are of dubious utility to Royals, particularly during the damage step, it makes sense to bring out Flogal over Llew as a free booster--while she won't be bringing anyone over the absolute borderline, this build is going for cheap rather than earth-shaking. Come BT03, this strategy isn't of particular effect due to cards like Still Vampir being around, but the reasoning behind it is still worth consideration. While his real strengths are brought out by BT02 with cards like Gigantic Charger and High Dog Breeder Akane, those cards are best dealt with in their own articles. For now, consider that unlike Brigitte and Gancelot, Alfred has use as both a vanguard and rearguard, since his ability to superior call is present regardless of which circle he is brought into. And if called as a rearguard, Alfred can be boosted, by Lionmane Stallion, up into a full 20000-power unit for a soulblast 1. The Demon Slaying Knight, Lohengrin tends to be outshone by his more unique contemporaries, but as the clan megablaster he shouldn't be underestimated. His soulcharge autoskill will tune up the Royal Paladins from BT02 and BT03 to be highly consistent. The same skill also gives him +2000 power, which with Marron will let him stand just at the 20000 borderline, and his megablast(soulblast 8 counterblast 5) retires all of the opponent's rearguards when his attack hits, placing heavy pressure on the opponent to willingly sacrifice their hand. 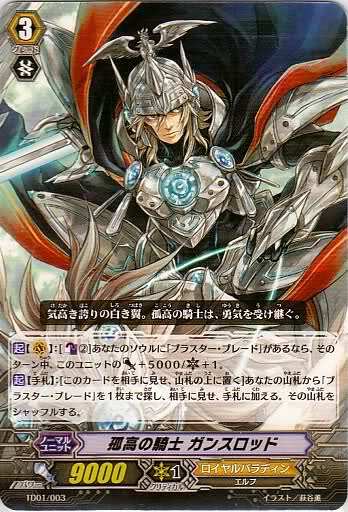 Since his megablast works as both a vanguard and rearguard, Lohengrin carries the same basic level of utility as the King of Knights. Closing this update is the promo vanguard, Alfred Early. This I would rank as one of the most underappreciated cards. His skill is twofold, simultaneously superior calling Blaster Blade from the soul while allowing a reuse or first use of Blade's skill. While Early does not have nearly the same level of use as his King of Knights counterpart, his skill is also without cost and can potentially thin the enemy's field. Furthermore, it mitigates the loss to one's hand made when riding, by adding a card to the field. In this way, the cardfighter running Early has played two cards for the price of one, and in particular if Blaster Blade was superior ridden through Llew's skill, then this is the second time that their ride was "costless," since the gain negated the loss. Functionally, all this is comparable to adding cards to one's hand.